Offers the Calming Benefits of Marijuana without the PsychoActive Side Effects of TetraHydroCannabinol ( THC ), GOO CHILL contains PhytoCannabinoid rich (PCR) oil extracted from whole plant Medicinal Grade Hemp grown in the USA. In addition to several therapeutic PhytoCannabinoids, Terpenes and Flavonoids are included creating what is known as the Entourage Effect, providing a full spectrum of benefits for your Animal. Involving three Primary Pathways, Longvida Optimized Curcumin represents a New Paradigm for Healthy Brain and Cognitive Health. 3) Regulation of Lipid and Protein aggregates in the Brain. First, Oxidative Stress is a central factor contributing to Drain Degradation. Curcumin’s Antioxidant Activity is generally considered to contribute to its diverse Therapeutic Effects for the brain and target organs. Secondly, Neuro-Inflammation is cited as a major issue for brain Degradation , presenting opportunities for Nutritional Interventions. Numerous research studies have found Curcumin Modulates Inflammatory Response by Down-Regulating activity of many Inflammatory Markers. The Third pathway impacted by curcumin is accumulation of amyloid and tau protein in tissues such as the brain during the aging process. Data from a multi-center human trial in Australia and the U.S. shows Longvida curcumin can bind to amyloid plaques in brain tissue in less than one week. Optimized Longvida with BioActive Curcumin Molecule promotes GastroIntestinal BioAvailiabity and Longer Lasting Action. Specifically formulated to Efficiently cross the Blood Brain Barrier and Rapidly support Cognitive Health. Recent Psycho-Pharmacologic Research indicates that Longvida improved Cognitive Brain Function, Mood, and Lessen Acute Behavioral Attributes. Longvida lessens Fatigue and improve Resilience to the Detrimental Effects of Psychological Stress or Mood translating to improved Calmness, Contentedness and lessened Fatigue. Further Joint and Overall Health Benefits relate to Longvida’ s Anti-Inflammatory and Anti-Oxidant attributes. Playing an Essential Role in Supporting Cognitive Function and Brain Health, Magtein Magnesium supports the “Source” of Healthy Memory and Learning by promoting Healthy Brain Synapse Density in Regions of Brain associated with Memory. Aging and daily Stress induce Dysfunction and Loss of Synapses, resulting in diminished Cognitive Networking. All Animals need to have the Correct Balance of Calcium and Magnesium. When a Dog becomes STRESSed, Anxious, Nervous or Excited, they Burn Off Magnesium. This allows Calcium to overload Muscle and Nerve Cells and replicates the Rise of Adrenaline. This can cause Erratic Behavior, enhanced Sensitivity, Nervousness, Aggression and/or Tension. Studies indicate that Magnesium Deficiency may contribute to numerous Mental Health Issues, including Anxiety. Magtein Magnesium is a Calming and Relaxing Mineral. It regulates the Nervous System and may help Animal cope with Stress so as to Prevent Anxiety, Fear, Nervousness, Restlessness and Irritability. Magtein has high brain BioAvailability and has been Clinically Proven as the only Magnesium Product to effectively Pass Through the Blood Brain Barrier, raise brain’s magnesium levels, which leads to improved Memory and Cognitive Functions. Magtein’s heightened Magnesium Levels have been found to Enhance the Brain’s Ability to Reduce Fear and Anxiety Responses by increasing the ExtraCellular Magnesium Concentration in the Brain, the Cognitive Ability – an Important Facility that Controls Fear and Anxiety – is Enhanced. Magtein Magnesium L-threonate addresses Aging-Related Memory Decline and Cognitive Function. Magtein, Magnesium L-threonate maintains Health of the Neuron Cells and increases Neural Plasticity. By elevating the Brain’s Megnesium Levels, Control of Stress and Anxiety is achieved. Magtein Magnesium L-threonate, is the result of 10-Years of Research at MIT, is a truly unique Supplement whose unique properties bring enough Magnesium to the Brain to be “Functional”. Magtein™, magnesium l-threonate, is a patented, natural ingredient discovered by MIT professors searching for novel NeuroDegenerative Disease Treatments. For this reason, Magtein was extensively studied in cell culture, in animal studies for its mechanisms of action and its effects on brain function, as well as its safety. These results are published in prestigious neurological journals, including Neuron, and supported by top neurological scientists in the world, including Nobel Prize winners. One reason Magtein has generated so much interest is its unique mechanism of action: it restores the neural cells to their healthy, youthful conditions by blocking background signal activation, while many other brain ingredients/drugs continue stimulating cells. Recently, a human clinical study using Magtein was performed and preliminary results indicate a significant improvement in memory and cognition. Connect-the-DOTs > Canine Allergy Anxiety / Stress > Contributes to GUT-Biome Stress > Contributes to compromised GUT Functionality and an enhanced Bad Bug Balanced GUT-Biome > Decreasing the Animal’s Immuno Functionality and ability to Efficiently Digest Food > Placing Animal at greater Health Risk for rapid Development of Pathogenic MicroOrganisms > Placing Animal on Path of Increasing Poor Health i.e. Stress Diarrhea & Dehydration as well as compromised Quality of Life. Promoting GUT-Biome Health is Paramount to the OverAll Health in your Animal. The GUT is the Body’s largest Immune Organ, and is the Body’s First Line of Protection against Infectious Microbes that are Ingested, and it contains a Microbial EcoSystem that must stay Balanced for Optimal Performance in “All” Dogs. An imbalance of Microbes may be due to Elevated Levels of Bad Bacteria and Reduced Levels of Good Bacteria. Stress is often a “Cause” of Instability in this Microbial EcoSystem. 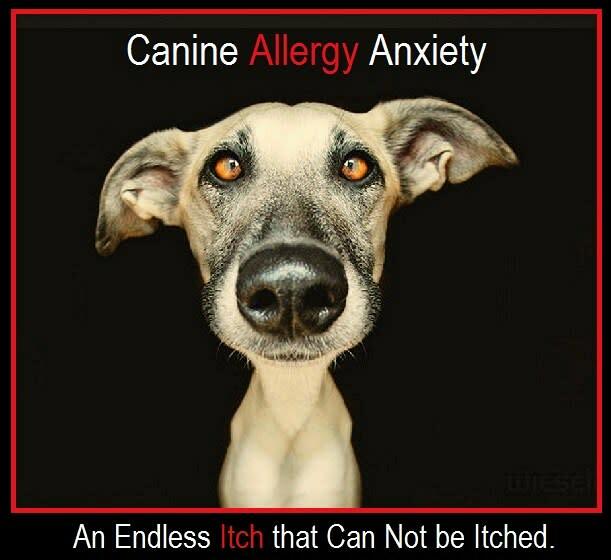 During periods of ( Canine Allergy Anxiety ) Stress, Your Canine’s GUT-Biome can be Negatively altered decreasing the Animal’s ability to Efficiently Digest Food and potentially placing the Animal at Greater Risk for Rapid Development of Pathogenic MicroOrganisms. GOO CHILL’s Yeast Fermentate Positively alters the Animal’s GUT MicroFlora, improving Digestion, decreasing Risk of Animal succumbing to Pathogenic Bacteria, and Aid in Host Immune Response. High GUT-Biome Integrity results in Longer Villi and Thinner Intestinal Membranes, providing for a Larger Surface Area for enhanced Digestion and Nutrient Absorption. GOO CHILL’s Yeast Fermentate is a wholly natural ingredient, derived from the Cell Wall of Baker’s Yeast (saccharomyces cerevisiae) and contains the highest quality beta-1,3/1,6-Glucans, Proteins, fibers, polyphenols, vitamins, amino acids, beta glucans and many beneficial metabolites that work together on many levels to support a strong immune system. Throughout evolution, the Immune System has ‘Learned’ to recognize its molecular structure as a reliable trigger. Beta-1,3/1,6- Glucans Function as a “Signal” that alerts the Immune System, prepares it to respond Quickly and adequately to STRESS / Infections and renders more Resistance to any infectious organism. For your Anxious Dog, GOO CHILL makes “Chilling” a GOO-Licious Peanut Butter Treat ! Method to GOO CHILL’s GOO-Licious Madness ! As Pet Parents know, when trying to Quell an Animal’s Nerves, the last Thing that a Pet Parents wants when Administering a “Calming” Treatment is to introduce “More Stress” to the Animal / Situation. Still further, as We All Know, the Best Therapy / Drug / Supplement in the World is UseLess “If” the Patient / Consumer or “Your Dog” is Not Compliant. 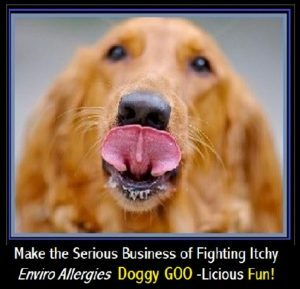 So, by making GOO CHILL a GOO-Licious Peanut Butter Treat, not only is Your Dog GOO CHILL “Compliant”, but “You” are Compliant, because Your Dog will “Remind” You that it is Time for GOO CHILL. And best of All, the Calming Benefits of GOO CHILL are Transferred Seamlessly & Bio-Effectively. Peanuts > Protein, Vitamins, Minerals & More ! With 7 Grams per Ounce, Peanuts have more protein than any other Nut. Protein is essential for Muscle Growth and Maintenance. Vitamin E: E is an Esseneial AntiOxidant that Helps Protect Cells from Oxidative Stress, a normal, yet Damaging, Physiological Process. Magnesium: Magnesium is Important for Muscle Function inclding Heart, Enzyme Function and Energy Production. Folate: Folate is needed for Cell Division, which means that adequate Folate intake is especially Important when Tissues are Growing Rapidly. Fiber: Fiber adds Bulk to Diet and Helps Body feel Full Longer, while aiding Digestion. Manganese: Manganese is Important for processing Cholesterol, and Nutrients like Carbohydrates and Protein.